Bathroom brochures often tease with large, spacious layouts, full of spacious bathroom designs that would look perfect in a spa. For many homeowners, bathrooms like this are a pipe-dream, since we live in such small houses. If you’re thinking of replacing your bathroom, but you can’t find a suite that fits, you’re not alone; 33 per cent of UK homeowners say their bathroom is just too small. Between 2003 and 2013, the average UK home lost around 2 square metres of floor space, and this downward trend is likely to continue. Lack of space is a practical challenge when furniture is made to a standard size, and that’s particularly true in bathrooms, where the plumbing may be difficult to move. In a small terraced property or bungalow, there often isn’t space for a full-sized bath, and moving around the room is difficult. In some parts of the country, many houses originally had outdoor toilets, and this has lead to clumsy adaptations of indoor space when the washroom was brought indoors. Bathroom design has come a long way since the chunky avocado suites of the 1970s, and the best way to make the room feel bigger is to shrink the items within it. If a huge sink dominates your bathroom, look for a compact, contemporary alternative that sits flatter and neater against the wall. Making use of corners is essential too. If your furniture feels too claustrophobic when placed at right angles, consider a triangular sink or or toilet cistern so that one item sits at a diagonal to the rest. A slim, oval shaped wash basin will help to improve access through the bathroom without impacting on usability or convenience. On the sink and bath, and a single mixer tap leaves more space for accessories compared to a larger double tap. If floor space is at a premium, avoid floor-standing sinks; wall mounted units offers handy storage space underneath. And if you need a bath, rather than a shower, consider a ‘space maker’ bath with curved sides. For tiny bathrooms, a square bath you can sit in could provide the functionality you need. 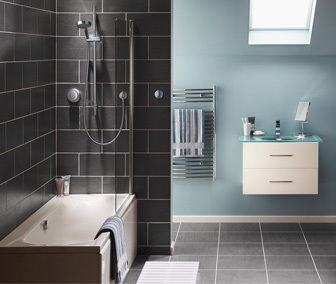 The challenge in a bathroom is to retain enough storage space for family bathroom essentials. That may include bulky towels, toiletries, and space for cleaning products. A quarter of UK homeowners use their bathroom as a space to relax, so the bathroom should be planned to avoid the risk of clutter and mess. If you have high ceilings, choose tall, narrow cabinets that stretch from floor to ceiling. Place storage rails or shelves above mirrors where seldom-used items won’t be missed. Multifunctional units are essential; the Ideal Standard Concept Space range includes clever modular units, with drawers that can nest and stack to store nick-nacks and personal items. Bathroom manufacturers are increasingly responsive to small bathrooms, given the changing size of our homes. Fortunately, the clean lines of modern bathroom suites lend themselves well to these restrictive spaces. Using a little ingenuity, you can create a place of bliss and relaxation, providing you’re happy to think ‘out of the box’. Web Design by First Internet.